In the southern district of Rwanda a new HIV association is starting to develop project proposals to fight stigma and poverty. The Ubutware Bwo Kubaho association is implementing their goat project that they began to plan in September. We have another new community in northern Rwanda with an HIV association in Musanze. Also in Musanze, but in a different sector and village, the Kinigi group is developing their plans for agriculture production. In the southern district of Rwanda, the Ubutware Bwo Kubaho group has been organizing and collecting goats for their MicroGrant project. Out of 90 total goats they have found 48 and excited to finally see their plans put into action. They aim to see all 1701 cooperative members have a goat in the following years. They have a savings account set up where members will put small amounts in weekly and the money will be reserved for emergencies, such as when a member (or a goat!) gets sick. Some of the women shared information about their history, what happened during the genocide and how hard it is today for them to meet their basic needs. Their excitement over the goats and eagerness to start projects to improve their living standards was a touching contrast. Next door to Ubutware Bwo Kubaho is a clinic where a newly formed HIV Association is struggling; members are dealing with high rates of stigmatization, food insecurity and poverty. The members have identified stigmatization and poverty as their main problems and designing proposals for businesses that will promote their strength and fight stigmatization by showing that HIV+ people can run successful projects. Their ideas include animal rearing, basket weaving, setting up HIV clubs, running a shop to sell grains, selling honey, and making and selling soap as a community. 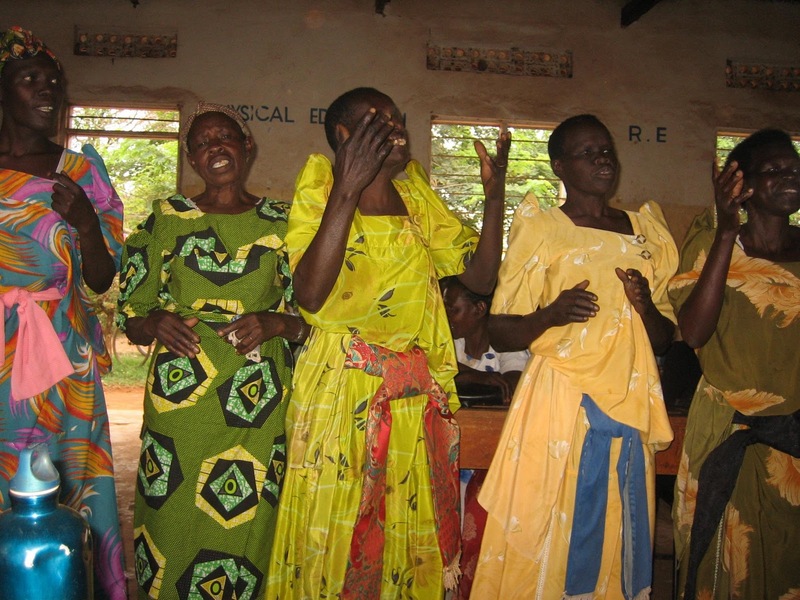 For both the basket weaving and soap making projects, they mentioned the group could do the work together and when they hold meetings, they could have action steps to take within the business, such as make more soap or train more people basket weaving techniques. A few members shared that they had skills they could teach other cooperative members and help their business. Above is a picture of a woman presenting a proposal her group came up with around the idea of basket weaving. Over fifty people participated in the meeting. In the north, two communities are developing their proposals. One is in Kinigi, where they are going forward with a project proposal to address food insecurity through planting potatoes. Families in the community rarely have enough food and their diet is not very diverse, leading to malnutrition. A mother in one of the meetings was failing to breast feed because her body could not produce enough milk. Hopefully with their project household nutrition will increase. 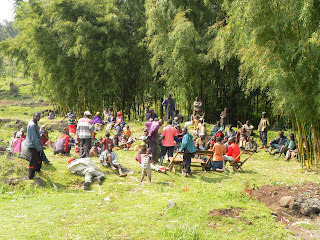 The last meeting was held with over eighty people from the village to plan for cultivation. 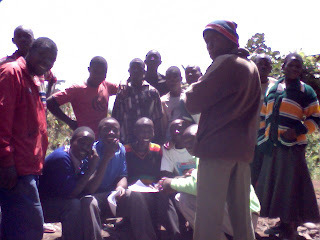 To the left is Ernest, our facilitator in Kinigi, with a group discussing how to share the land. 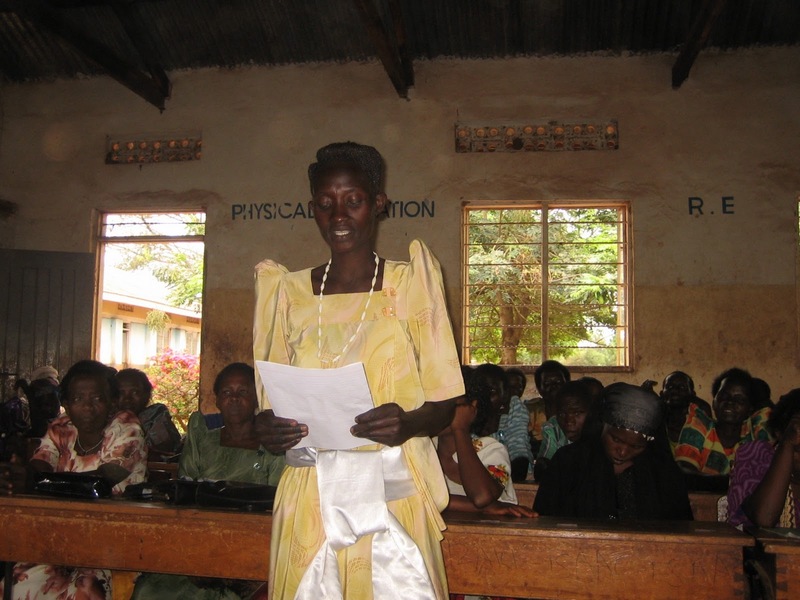 In another sector, an HIV association is developing a number of proposals to fight stigmatization, increase education, and support people who are very badly affected by the disease. These plans are in their initial stages but include caring for people who are hiding from the community out of shame, holding fun activities with school groups for testing and developing an outreach program to bring activities to communities in three sectors. The photo on the right is of a youth group that wants to establish their own association for fighting HIV/AIDS and stimulating fellow youth to do so as well. 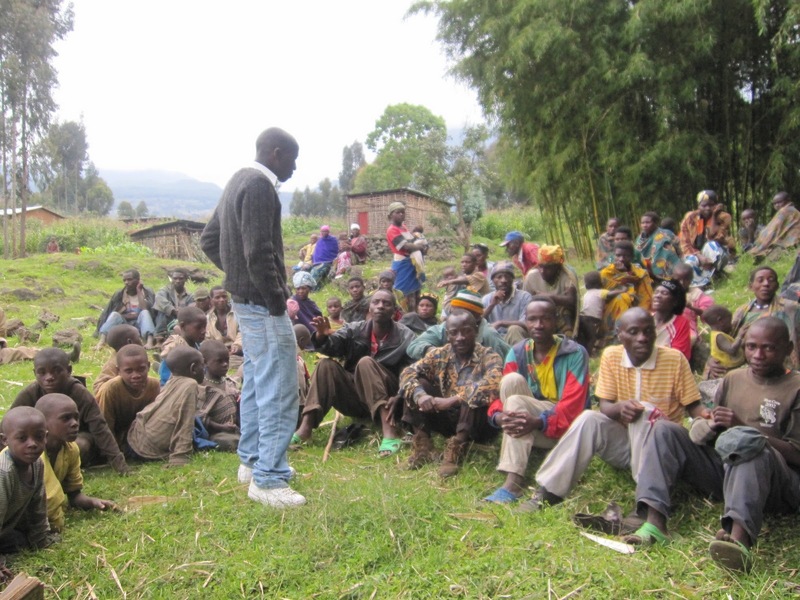 Over the past two MicroGrant meetings with a rural community in northern Rwanda, ‘tribal’ divisions have been ever present. 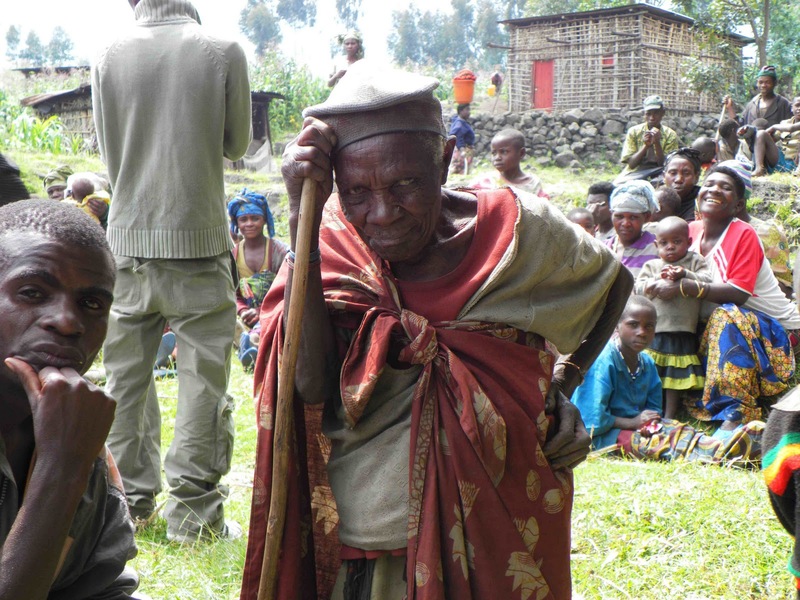 Pygmies and non-pygmies have clashed in meetings; one women threatened to leave multiple times but then was reminded that leaving wouldn’t help anything; if she stayed, she could gain agricultural support. Many of the men brushed off her attitude saying she was caught with ‘tribalism’ and sick in the head. The first meeting was quite rowdy over the issue, however, in the second meeting, the community came together. The woman, who caused ruckus in the first meeting, voluntarily gave a summary of the situation at the commencement of the second meeting. 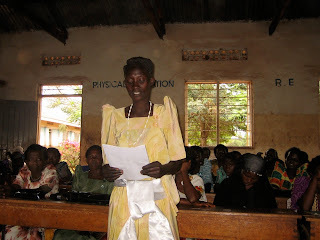 She calmly stated that they had discussed pygmies and it was clear the community has to work together. Both groups were present at the meeting. The MicroGrant is for a whole Umudungudu, (a Rwandan village). The chosen problem is food insecurity and their primary proposal surrounds starting a group agriculture project while a secondary project focuses on home gardens. The MicroGrant will be implemented in two phases, the first implemented in time for the February planting season and using the group model and the second phase will be for home gardens. The second phase will be conditional on success of the first. The third was peacefully voted on as the best resolution. During the next meeting they will develop their proposals and implementation plans. The group was much more focused and dedicated to working together during the second meeting rather than during the first. Local government officials are keen on the MicroGrant opportunity and have expressed their sincere thanks for working with the Umudungudu and bringing the people together, rather than keeping them segregated. The relationship between Spark MicroGrants and the community is reminiscent of conditional aid to states, where states must perform and meet certain democratic standards to receive aid. Now we are seeing this on the ground level, and we are sure to learn a lot from the process. 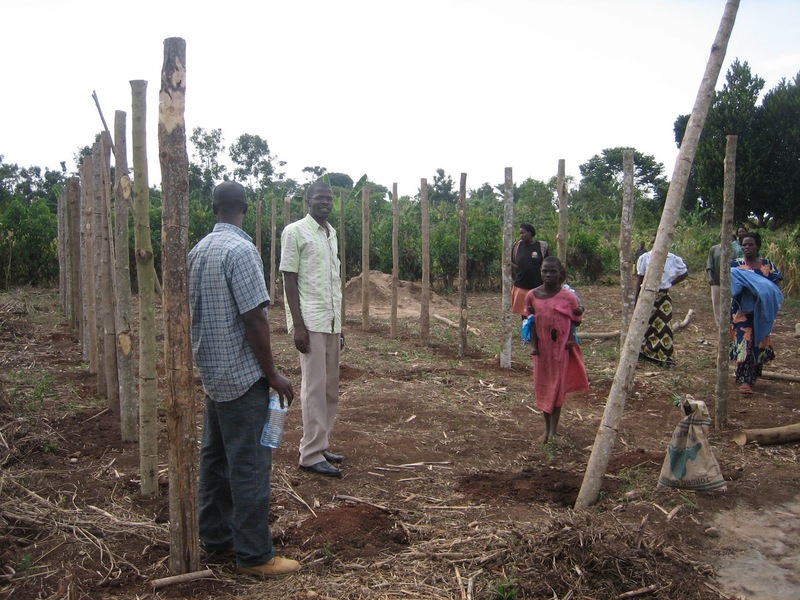 At the end of December I visited Uganda and the MicroGrant communities that BESO has been working with. 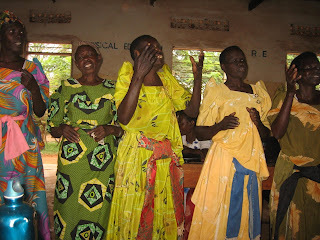 The very fist MicroGrant in Uganda is being implemented with a group of Women from Wanteete Village. The women are building a pre-primary school. 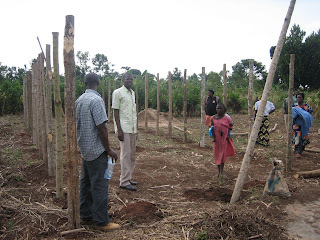 Since October, their school garden has flourished, their pigs are healthy and the land where the school will be constructed has been cleared, the latrines are nearly done, wooden poles are standing (donated by both men and women in the community) and the women are planning their fundraiser. The school will serve the children in the area who are currently just sitting around. A school will provide a space for stimulating thinking, innovation and growth. The women are writing a new proposal for additional funding to support additions to the school, primarily to expand the land and improve on the structure of the buildings. The Wanteete celebration in October, that commenced the implementation of their MicroGrant project, gained attention from neighboring villages. An association of women from a one village even organized to traveled and attend the celebration. The association, supported by a strong and engaging female politician, invited us to their meeting hall to discuss MicroGrants in December. The event was populated with reporters and politicians who are preparing for the upcoming Ugandan elections. The association was excited to have their own opportunity at a MicroGrant, and with politicians wanting support; they will hopefully be supportive of the project and the women. The community listed out a number of problems facing them and projects they would like to implement. They have already started a chicken project to generate eggs for their children to eat and purchased chairs for their assembly room (and to rent out for income), but they still face severe problems and lack the resources to put new ideas into action. Some of the problems they listed included: a reliable water source, feed for chickens, women’s knowledge on their rights, early marriages and lack of vocational training. In the coming weeks the BESO staff will start discussions around which problem the community would like to address with their MicroGrant of $1500!